Each new player at the Mirror Bingo receives a 100% Welcome Bonus. That’s £20 free when making a minimum first deposit of £20 and as much as £150 when opening an account with the maximum to be matched. Then, as soon as that bonus has been spent, every new deposit of £10 or more is matched by a 50% free cash bonus up to a maximum of £50. 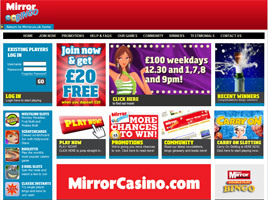 The Daily Mirror, Britain’s brightest tabloid newspaper, teamed up with the Internet’s leading marketer of Bingo games, Cashcade Ltd., to create the Mirror Bingo, a vibrant online venue for 75-ball and 90-ball action. Every week, the web site guarantees £10,000 in prizes will be awarded. It uses software licensed by the Government of Gibraltar, while maintain offices in London. All of the communication is in English, and the British pound is the currency used for play, which can be initiated without the need for any downloads. The Mirror Bingo features both traditional U.K. 90-ball bingo and the U.S. 75-ball version of the game. There are plenty of special pattern games, too, including the site’s exclusive M, I, R, R, O and R games with extra bonuses. And cards start at just 5p. A number of new 1TG and 2TG sessions have bee introduced—that’s one to go and two to go Bingo for even more ways to win. The games are played between 1pm and 2pm GMT in the Mirror Bingo’s “Spread the Wealth” room. Another recent innovation here is “Equal Cards Bingo,” a new daily game that offers everyone an equal chance of winning by limiting the number of cards that can be purchased to exactly twelve at 10p each. No more or no fewer cards are permitted, leveling the playing field for one and all. The games take place in the Bingo for Britain room between the hours of 8pm and 9pm GMT. Also popular at the Mirror Bingo are Speed Games. From 7pm to 8pm daily, the Bingo Boogie room is the venue for 75-ball action with a twist—the first player to Bingo with four corners wins. It costs just 10p to enter a card in this Fast Lane. .
Of course the Mirror Bingo has lots of guaranteed jackpots, too. All of the “big money” games take place in the Bingo Party room, and cards can be reserved in advance by using the pre-purchase tab in the lobby. The biggest prizes go for 75-ball coverall games. To complement the intense Bingo action, Chat Games and Tourneys are offered. Instant win games are also available in the lobby, along with a good range of slots. Choose from among scratchcards, lotto, and keno games, which feature top prizes as high as £25,000. For the time of initial deposit, every player is automatically enrolled in the Mirror Bingo VIP Membership Scheme. It has been designed to reward all players in the bingo rooms, so that the more they play, the more they get back. Members rise through different membership levels: Basic, Bronze, Silver, Gold, and Platinum. Incentives are provided, from cash and prizes to free lucky draws and holiday bonus gifts. Players also earl Bonus Points (BPs) that can be redeemed for cash or free Bingo game entries. Every new player starts off with 2,000 BPs. Additional BPs are earned for referring friends or purchasing Bingo cards at a rate of one BP for every 10p spent. Accumulated points can be redeemed at a rate of £1 for every 1,000 BPs. Weekly and monthly draws are held and great prizes are awarded. Recent winners have claimed anywhere from £50 in cash to a luxury trip to Egypt, a cruise around the Mediterranean, and a year’s supply of Thornton’s chocolates. Occasional Team Bingo events are organized, as are “Beat the Monday Blues” giveaways and seasonal leader board tournaments. The Mirror Bingo also sets up meet-ups in London, Newcastle, or Birmingham so that Bingo buddies can meet face-to-face in the real world.